I took a left onto Christinenstraße and Lottumstraße situated a few blocks near Senefelder Platz (hello, birthplace of lithography in the 1790s!) and Rosa-Luxemburg-Platz (hello, political revolutionary in the early 1900s!). It’s captivating to feel the magnitude of history at any given corner in Berlin and one of the things I love about this city…. Just think: printmaking and politics (i.e., the great-great+ grandparents of stickers) go back hundreds of years right at this locale. While there, I photographed about a dozen political stickers, which you can see on my new Stickerkitty map. If you click on any of the images on the bar along the bottom of the screen, it will show you where on the street the photograph was taken. 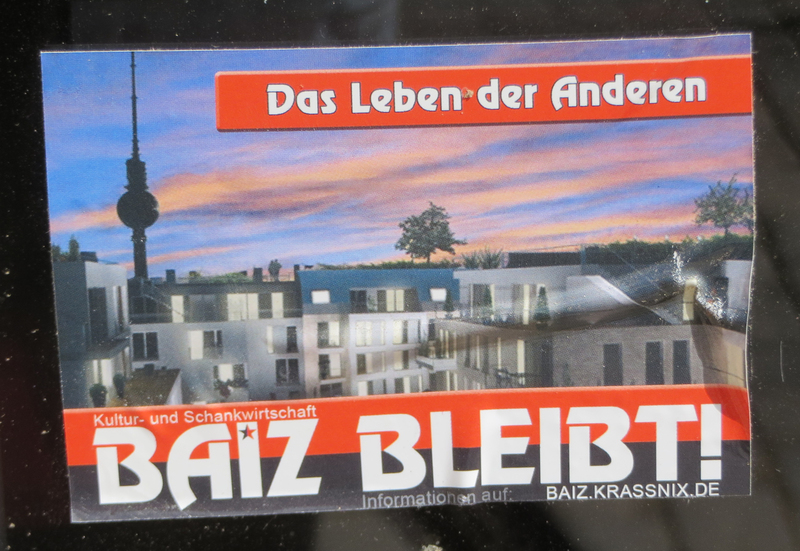 Here is one of the stickers with the “BAIZ Bleibt” motto. Other than the rash of political stickers, there was nothing out of the ordinary along this quiet stretch of the neighborhood. A few bicyclists rode by, and parents were walking home with their kids after school. The big elephant on the street, however, was a huge multi-storey crane working on a building demo and/or renovation. Construction workers loaded their cars at the end of the workday. Cranes and construction workers are ubiquitous in Berlin, but now I understand why the stickers were there to protest urban development. The geo-tagging is giving me an opportunity to look at the time and spatial placement of stickers in a new way. I like how the quantitative data leads to a qualitative description.